Robins thrive in countries like northern Canada and the United States as well as in Europe. These birds are often seen around open spaces like meadows, gardens, backyards, but often inhabit bird houses that humans put up for them. Robins like to find homes in artificial places provided by human development, and lots of strange places they find convenient. Robins have been seen to nest in cavities like cars, kettles and old boots left on the sides. When the birds nest season starts if the proper birdhouse is provided there is a high chance of them inhabiting it. If you want to attract these birds, it is a good idea to install a special open nest birdhouse for them. These birds don’t like to stay in closed type bird houses, and these will attract other species of birds if you have one. 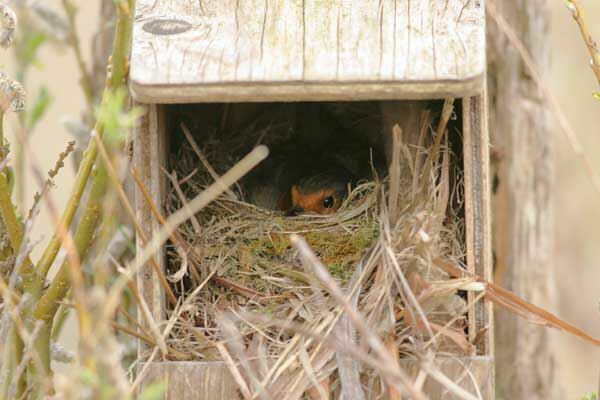 The house that is pleasing to robins is one with and open design, and a nest shelf where the nest will be build. Robins mostly choose open platforms compared to the enclosed birdhouses because of the open view they provide. It is best to mount your platforms in an area facing trees or plants or open spaces on the side of sheds, for instance. If you have bird feeders in your backyard, it is best to use earthworms as food, to attract robins. They like to hunt on the ground and if you have a lawn these bird will visit often to look for food. American robin numbers are widespread and the population is stable at the moment, in some places even on the rise. It is good to know these birds are doing well. This robin bird house is made if western cedar wood. It is designed to provide a nesting shelf liked by robins and will attract them. It is best to place it on a quiet place where people will not disturb the birds. Check the price of Backyard Boys Robin Box here. It is best to place it next to a lawn, and near bushes or some trees. These birds hunt for worms and insects on the grounds, and will inhabit your robin bird house if you install it next to these places. American Robin can produce three good broods in single season. But on average, though, only 40 percent of these will have healthy baby birds. So if you see your bird house occupied more than once in one season it is perfectly normal. They will have from 3-5 eggs in the nest. You can provide fruit as a food supplement to them in your backyard, or next to a robin bird house to attract them more.